From the office cubicle cactus to the tinselled Christmas tree, houseplants are casual signifiers of comfort and happiness, but they also serve aesthetic and symbolic functions. The use of plants as sculptural material – real plants, not representations – began in the late 1960s, turning the Earthworks movement outside-in, as Marcel Broodthaers adorned his installations with potted ferns and Giovanni Anselmo strapped leaves to stone for their potential to rot. Ecological activism this was not. Today, in an exhibition titled ‘Not to See the Sun’, Heidi Norton continues this strategy with sculptures that incorporate living plants encased in wax, glass and resin. It’s a type of perverse gardening where houseplants can be admired for their spontaneous contours, but, uprooted and painted, are doomed to die for our visual pleasure. Norton suspends some of the tangles of rhizome and root in air, left to desiccate as their leafy bodies brown and fuzzy in plain sight. The mini-cacti could survive, if watered and sunned, in their wax-splashed glass terrariums, but other sculptures were made to degrade in a rococo play of decoration and mortality. This tension highlights the confused relationship that humans have with nature, like a biologist who must kill something in order to understand how it lives. Norton’s herbariums successfully re-imagine the plant’s organs as readymade collage materials, and ultimately posits an alternative use for the plants, neither healthy nor ornamental. 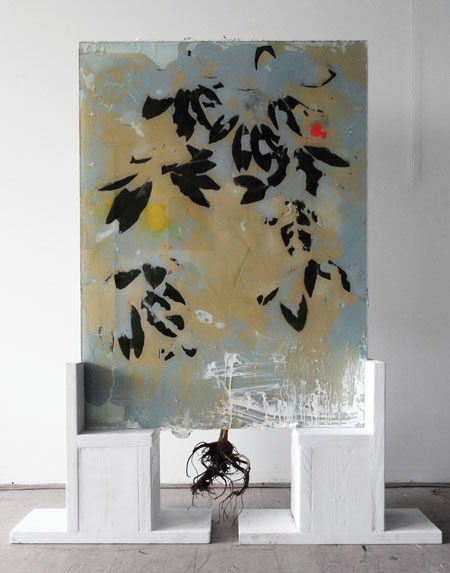 When integrated into compositions with mirror shards, melted wax, spray paint, faded books, photographs and other fragments of life, Norton assembles a natural history of the present moment, as if to stop time. Although her objects evoke the primitive technologies of altars, sacrifices and offerings, scatter divination and sacred geometries (as in Mercury and the Perfect Triangle, all works 2011), such quasi-mysticism is quieted by Norton’s museological impulse to collect, display and contemplate. In 1982, Joseph Beuys planted 7,000 oak trees as a botanical art installation, part of the artist’s Energy Plan for the Western Man. ‘Enough with the invisible powers already,’ is Norton’s response to his bio-cultural project, written in one of the altered books stuffed with pressed plants and marginalia in After the Fires of a Little Sun, a collaboration with writer Karsten Lund. The critique of Beuys reveals Norton’s relative position among her precedents – as a symbolist, not an environmentalist. ‘Not to See the Sun’ was presented on the cusp of winter and spring in Chicago, whose city motto is ‘Urbs in Horto’ – or city in a garden – although its plants hibernate longer than they bloom. Plants in domestic collections and Chicago’s few winter gardens hold vigil during the extended Midwestern winter, shuttering the city beneath an indifferent glass bell-jar, as if to suspend entropy. Norton’s fossilized plants and the visceral wax puddles are like silver-gelatin snapshots of the deceased, revived but frozen in time.